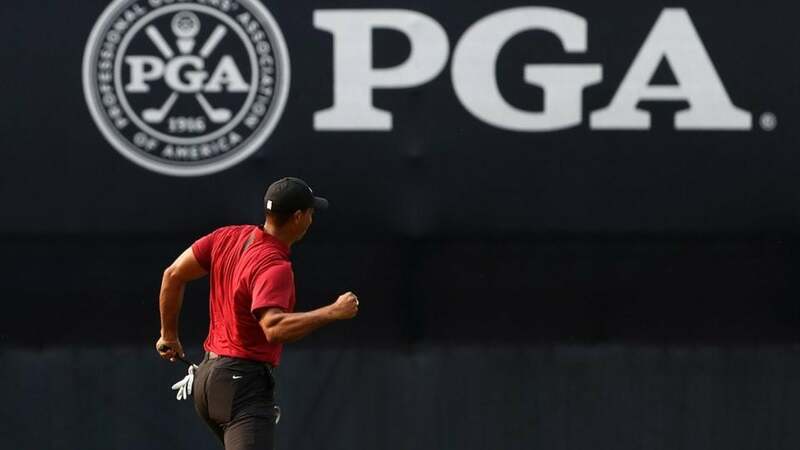 Tiger Woods reacts after making a putt for birdie on the 18th green during the final round of the 2018 PGA Championship at Bellerive Country Club. ST. LOUIS — You're tempted to say he's the hardest-working man in show business, except Tiger Woods isn't in show business. That's the root of his greatness and his greatest challenge. As a public being, he'd like to be judged, first and foremost, as he judges himself, as an athlete. But the world won't stand for that. The modern elite athlete must also be an entertainer, a showman, a celebrity, a philanthropist. A role model. It's too much. On Sunday, we saw the version of the man that truly captures and inspires: Tiger Woods, athlete. "He shot 64 when he looked like he was shooting 74," said his playing partner, Gary Woodland. "Only a great athlete can do that. He missed that five-footer for birdie on 1, got mad, stiffed it on 2 and made that." Woodland's caddie, Brennan Little, was caddying for Mike Weir on Sunday at Medinah in 1999 when Weir was paired with Woods and Woods won his first PGA Championship. "That was intense," Little said Sunday night. "This was more intense." That was then, Tiger Woods at the start of his professional career. This is now, Tiger Woods deep in the back nine of it. Then there would be more chances forever, until forever disappears. These were his four scores: 70, 66, 66, 64. Only one player shot better, Brooks Koepka, who won by two over Woods and three over Adam Scott. Koepka is 28 and his body never aches. "If you're working out every day, you're not going to be sore," he said Saturday night, 24 hours before the coronation ceremony as the (unofficial) best player in the world, the (unofficial) player of the year, the (unofficial) future first ballot Hall of Famer. Tiger Woods is 42 and his body always aches. He's probably taking an ice bath right now. The things we do, to pursue the things we want. Woods wants a 15th major, his kids at the awards ceremony, a new last chapter. He may not realize—he may be too close to the action to know—that he is already at work on an exceptional third act. Act I of his playing career was called Talent + Work. Act II was called Obsession + Work. Act III, a work in progress, is called Trying. Who cannot relate to trying? It's what we tell our kids and our better selves, right?